Arachnophobes, avert your eyes! 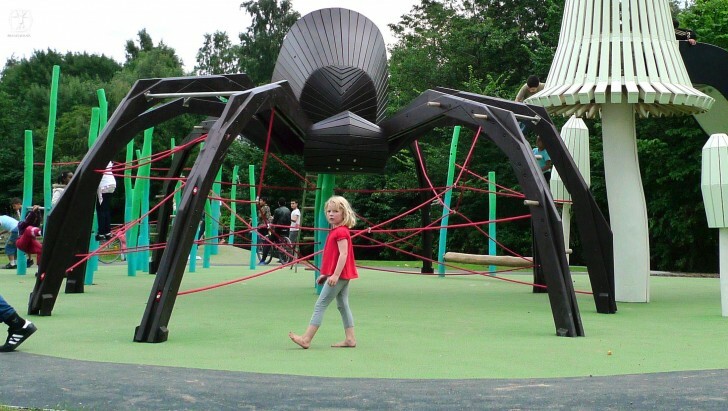 That terrifying scene starring Shelob the giant spider from The Lord of the Rings 3 has seemingly sprung to life in the form of a playground near the Danish city Hillerod. Kids will get a kick out of climbing up this creepy crawly jungle gym… that’s if they’re not too spooked to play. This 15.7 foot Giant Spider structure—a collaborative development by Denmark design team MONSTRUM and “Kongevænget” housing—gives way for children to actively weave a web of play and infinite activity along the steel bars and ropes for an exciting climbing opportunity. Little ones as young as five and even teens as old as fourteen enjoy climbing the araneae like a tree house. 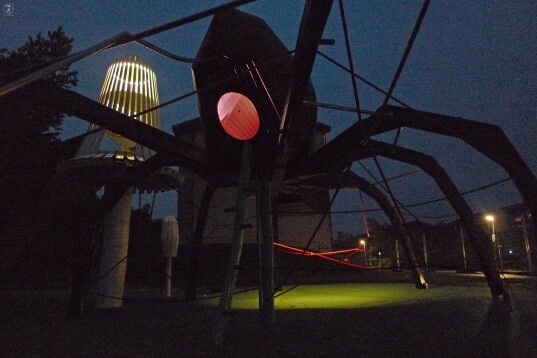 Featuring eight super-sized legs and LED lights that sit in the spider’s interior to emit a warm nighttime glow, there’s no wonder the Giant Spider and the accompanying mushrooms she is scurrying about across the forest floor are a fan favorite. The Giant Spider has spun an intricate web of rope between her legs for the adventurous kids who welcome a game of strength and endurance. Surrounding her is an environment rich with fungus (also containing built-in LED lights), a forest of high grass made from Robinia logs and wooden grass ends with a glider course for expanded play throughout the lawn area. This playground is no easy feat and will take both courage and skill to master. The playground offers challenges for all children, but it will be the most agile climbers possessing the biggest dose of Spidey-sense, who will be able to make it to the top. Kids will get a kick out of climbing up this creepy crawly jungle gym… that’s if they’re not too spooked to play. Little ones as young as five and even teens as old as fourteen enjoy climbing the araneae like a tree house. The playground offers challenges for all children but it will be the most agile climbers who will be able to make it to the top. The Spider has spun an intricate web of rope between her legs for the adventurous kids who welcome a game of strength and endurance. Next to the spider are three big mushrooms, one of which is quite monstrous and boasts a slide. Surrounding her is an environment rich with fungus (also containing built-in LED lights), a forest of high grass made from Robinia logs and wooden grass ends with a glider course for expanded play throughout the lawn area. Perhaps playing with a spider of this nature will squelch childrens' fears of the unpopular insect. Thar she glows! LED lights create a spooky ambiance when night falls.